This warthog was made for two reasons; it hung above a fireplace in the Jabberwocky film, and was then lent to some LARP friends who hung it on the wall in an inn. It´s a fairly simple construction ­a clay sculpt used as a base for a three-part Ultracal mold. Mask-making latex was poured in to produce a skin, and when vulcanized filled up with cold foam. The head was coated with PAX paint and painted with acrylic airbrush paints. 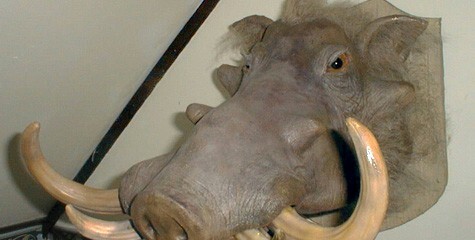 The tusks are also foam-filled latex cast seperately. The hair is crepe hair attached with ProsAide. The eyes are (I believe) gorilla eyes, mouth-blown in glass from Germany. The plaque isn´t wood but simple papier-mache. The whole thing is really sturdy and light.